The recent H1-B visa distress has given rise to the ‘Canada Immigration’ searches across the United States of America. The Trump Administration is said to be considering a proposal to prevent the H1-B visa holders from further extending their visa, even if their Green Card visa application is in process. As of now, they can extend their H1B visa if its term is over, provided they have a US Green Card application is pending. If the new proposal gets implemented, about one million people may have to leave the USA, hence it has become a matter of concern for the immigrants on the temporary H1B visa. This might be the reason that a significant number of H1B Visa holders in the USA are now looking for alternate immigration destinations to obtain PR Visa. 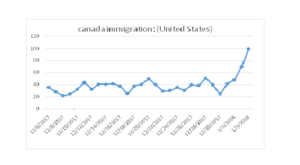 As soon as the news came with regards toH1B Visa extension, the online searches related to Canada Immigration sparked significantly across the USA. The main Canada immigration-related keywords, i.e. Canada Immigration, Canada PR, Immigration to Canada, etc. surged radically in different states and territories of the US. 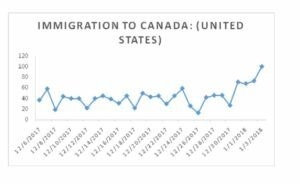 As per the search engine giant Google, the search for the keyword ‘Canada Immigration’ augmented drastically in the first week of New Year 2018. This was the time when searches hit the peak after H1B Visa announcement around Christmas. 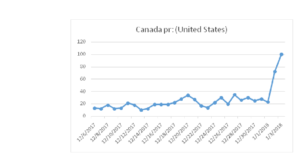 The search for keyword Canada PR also went high in the first week of January, i.e. around 1st to 3rd Jan, as visible in the below graph. US Green Card or Permanent Visa is looking way out of reach to the H1B Visa holders at the moment, hence, spark in Canada PR queries is untestable from the immigrants stuck in dilemma across different US states. 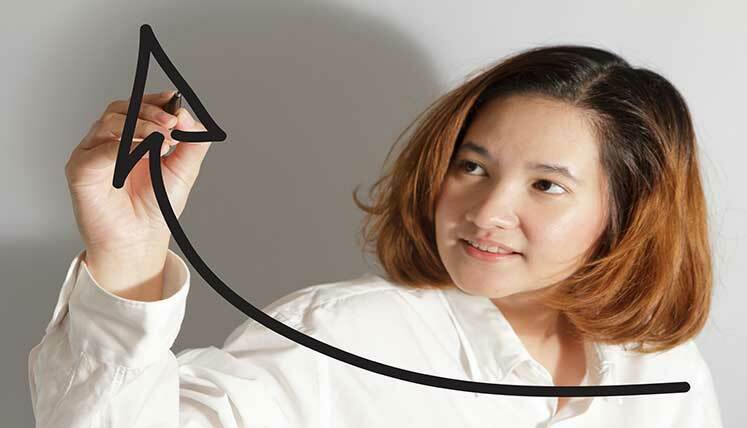 Canada as it is one of the best countries to get Permanent Residency (PR). Recently, US News and World has ranked it as the 2nd best country in the world for immigrants after Sweden. Another keyword searched the most around start of the New Year 2018 was ‘Immigration to Canada’. At now, over half a million immigrants from India and China are working in the USA on H1B Visa, while waiting for their Green Card Visa to get processed. All such immigrants are now searching pathways for Immigration to Canada and hence, the Google search for this keyword augmented drastically. If you are one among the aspirants of Canada immigration and PR in the USA, you may contact Visas Avenue Immigration- a leading Canadian Visa and Immigration Documentation Consultancy in India to apply for PR visa in Canada. Visas Avenue has an incredible success rate in terms of obtaining Canada PR visa for the Canadian visa applicants. You may call Visas Avenue immigration expert Toll Free Number- 78-18-000-777 or e-mail your queries to info@visasavenue.com.